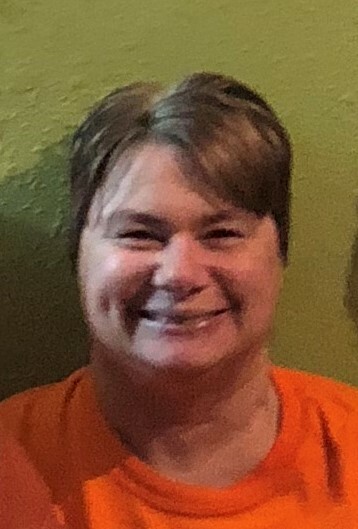 Christine “Babe” Jacobson Egger, 52 of Olin, Iowa passed away on Tuesday, November 27, 2018 at Jones Regional Medical Center in Anamosa, Iowa. A funeral service will be held on Saturday, December 1 at 10:00 a.m. at Lahey and Dawson Funeral Home in Olin, Iowa. A Visitation will be held on Friday, November 30 from 3:00 – 8:00 p.m. at Lahey and Dawson Funeral Home in Olin, Iowa. Burial will be held at the Olin Cemetery. Christine Renee was born on December 22, 1965 to Christy and Marilyn (Frett) Jacobson in DeWitt, Iowa. She graduated and went onto flight attendant school. She was united in marriage to John Egger on July 3, 2005 in Olin, Iowa. Over the years Christine worked milking cows on a dairy farm and working at Pearson. She enjoyed bowling, volleyball, slow-pitch softball, camping, crafting and candle making. She loved volunteering for anything and would help with the Olin Jamboree. She also enjoyed horseback riding and attending Iowa Football bowl games. Those left to cherish her memories are her Mother, Marilyn Jacobson of Olin, husband, John, son John Jacobson, three step-children; Lori (Josh) Hempstead of Manchester, Tom (Jenna Davis) Egger of Cedar Rapids, Mike Egger of Fairfax, three grandchildren; Elliot, Presley and Kenzi, sister Cindy (Mark) Miller of Olin, brothers Rick Bauer of Olin and Kevin (Deb) Bauer of Calamus and many nieces and nephews. She was preceded in death by her father, Christy. In lieu of flowers memorials may be directed to her family in her honor and will be donated towards the University of Iowa spinal cord rehabilitation center.